I am currently a Freelance Visual Effects Supervisor working at Prime Focus London on several broadcast shows and feature films. 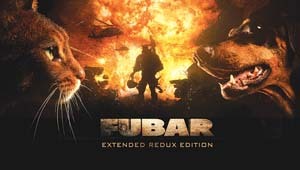 I was recently nominated for two Visual Effects Society awards – BBC One’s ‘Planet Dinosaur’ and Nova’s ‘Life Beyond Earth’ – and I’m currently getting ready to release my own short film ‘Fubar Redux’, an epic motion comic film about a political war set in an alternate reality with cats and dogs! I have wanted to work in film since the age of twelve when my dad put on a VHS copy of the film ‘Bladerunner’… I was totally blown away by it and would make mini models of cityscapes in papier maché whilst holding a cylinder to my eye like a camera. At the time of college (early 90s) video games were really a big part of my life and I was able to combine my love for cinema with the interactive world so, whilst I taking my degree, I did work experience for a games company working on cinematics and promotional material. I was exposed to editing and early visual effects compositing and throughout this time I was always trying out camera moves, doing things you wouldn’t be able to do with a real camera like spin around a bike as it’s racing along the track! During early 2003, the video games industry started to collapse due to big studios buying out the smaller studios. I was then working in a small studio in the North and really didn’t want to move back down South. So, to keep my self in work and busy I setup my own little CG company and was doing animation for music promos and corporate using high end visual effects.. in the evenings I would then work on my own small projects and did a short trailer called ‘The Chase’. I attended an Autodesk event and there was a ‘show and tell’ session but one of the presenters couldn’t make it. I overheard that they were urgently looking for a presenter to show off work and so I volunteered as I had a DVD of ‘The Chase’ with me anyway! Nervous as I was, I did the presentation and played the short trailer – and it got a standing ovation! I was asked to play it again and Autodesk asked if they could use it for their marketing campaign. I then got offered a job at one of the largest game developers/publishers in Europe and lead their team in creating action packed cinematics and marketing promos for their driving games. As the cinematics technology was getting more impressive in the games market, the more I wanted to combine the skills I was using with my love for cinema. I started sending out my showreel to companies dealing with VFX in film. Back in those times games and film were seen as separate industries, whereas today the two blend in really well as both use the same tools, craft and technical knowledge (particles, normal map creations, high poly modelling, motion capture, scanning etc). I knew I wanted to work in film when I saw ‘Batman Begins’ and I said to my partner I would like to work on the sequel if they make one! Several years later I ended up working on ‘The Dark Knight’ – one of the proudest moments in my compositing career! I started off doing roto and paint at Moving Picture Company and then ended up moving into compositing, mainly because I had already shown my compositing skills when doing complex rig removals plus my knowledge of Shake.. from there it was upwards over the years at several facilities worldwide as Junior Compositor then Compositor to Lead Compositor and then to Compositing Supervisor, which lead me to becoming a Visual Effects Supervisor. One of the many things I learned working in different areas of the visual effects industry, from feature film to commercials to music promos and even long form broadcast is – it’s all the same in terms of craft, technical and creative workflows.. the only difference is budget and schedule. With music videos you have very little time to do very ambitious things and usually work crazy hours, mainly for the love of the music track or directors work… I did loads of music promos at Partizan as well as co-directed some with Little Red Robot in San Fransisco with my good buddy Seth Shevosky who is now Exec Producing my short film ‘Fubar Redux’. Freelancing at vfx facilities on a project per project basis was the best model for me as opposed to being a full time staff artist because it meant I could have more variety in projects as well as pipelines. To do this I set up my own company – HaZ-VFX. I started it up as a way to keep on supporting independent projects such as short films and indies, whilst still working freelance on major feature films. These indie projects need VFX done to a tight budget whilst keeping production value high. Also, working on these indie projects keeps my feet on the ground and allows me to still enjoy and appreciate the film making process which you don’t often get whilst working on those big movies doing VFX in a dark room in a big facility. Working on smaller projects in my spare time also increased my experience as a Visual Effects Supervisor and Producer which got me gigs on high-end broadcast projects like ‘America – The Story of Us’ as well as feature films… so yeah, even though the indies are often low pay or no pay at all… it paid off as it enabled my Visual Effects Supervision career. Over the years I worked with some amazing people from artists to VFX Supervisors to Creative Directors and Producers at various facilities and studios worldwide and that’s one of the things I love about this industry, everyone knows everyone. So, when it came to me venturing into directing and creating my first short film, I knew it had to be visual effects driven. I was very heavy into 2.5D compositing, this is basically cheating 3D in a compositing environment as apposed to going into actual 3D CG cameras. I was one of the early users of The Foundry’s Nuke. So I had a good relationship with them and demo’ing the tool often for them in productions I was involved with. I approached The Foundry with an idea of creating a short film entirely inside of their powerful compositing tool Nuke and emphasising on the key function of a 3D space inside a compositing tool. I did some presentation boards and tests in late 2009. Instantly I was getting support from Matt Pleic and Richard Shaketon, senior product managers at the Foundry. They were key in getting all the support I needed to make this short film. I developed a visual style which would work well with the technology but also served the story telling aspect of the film. This style was – Motion Comics. Motion comics are basically cut down animated versions of each comic book frame using cut outs from the artwork to create parallax and depth with each shot. Examples can be seen on the Blueray of ‘Inception’ with the ‘Cobal Story’ or on the Blueray of ‘Predators’ – which have several motion comic stories which didn’t get covered in the film and of course, there is the ‘Watchmen’ animated comic DVD. I wanted to use my VFX compositing experience to take motion comic cinema to another level with extra depth and production values but still keeping the core principles of motion comic story telling. With 2.5D compositing this opens up a load of possibilities to push the motion comic visuals with better animation and more depth and cinematography yet treating each shot like a comic book frame or panel with good pacing, framing and action. I wanted to get away from the usual static like animated action or comic book drawn visuals you get in most of these motion comics. I wanted a photography based visual look to the film. I then did a presentation at the 2010 International Broadcast Convention (IBC) in Amsterdam as part of a show and tell presentation using ‘Fubar’ as a case study. I cut together an early trailer of the shots I had done and made it look and feel like a Hollywood film by bringing in my good friend Deelan Sital who cuts trailers and promos for feature film marketing – and Luis Almau on the audio and score to help package it all up into a nice glossy presentation. The trailer was received so well that I had people from the audience coming up to me asking when the film was going to be released – and it started getting press and media attention online with quotes like ‘Platoon’ meets ‘Animal Farm’. This completely changed my concept of the film from being a technical VFX short, so I started putting a story together and brought on a writer friend of mine – Geof Wolfenden. One of my favourite books of all time is George Orwell’s ‘Animal Farm’. I loved the idea of using certain animals to depict the chain of command politically. With ‘Fubar’ I chose cats and dogs as they have always been territorial animals but, at the same time, reflect certain characteristics which makes them stand out from one another. Each of them have their strong and weak points yet they both strive for territories. I used that to create the world of ‘Fubar’ and the metaphor of what’s happening around us today with the military, government, war, media and politics. I released the short film in Sept 2011. Again, its success completely took me by surprise – it was getting reviews and press attention from Vimeo – Short of the Week, VFX forums as well as short film forums. It was getting huge! It was really great that it was getting so much exposure but, because of its overwhelming success I felt it only right for me to get the opportunity to finish and release the film in its original final cut version – which wasn’t possible due to financial restrictions. There was so much that could not be shot and animated which, if included, would have completed the film – especially with some of the characters, plot and story elements that didn’t make it. I decided to figure out a way to fund the extended version and found Kickstarter.com from a friend of mine, who got his animated short funded that way. I liked the idea of crowdsource funding rather than the traditional route of getting funding from a film council funding board etc, because I wanted to own and keep all the rights to my film and do what I want with it. The idea is if you like the current short film and want to see the full version as it was originally intended, then please pledge and fund the Extended Redux Edition. In a way it was kinda like the short was a presale version. This was also my first foray into crowdsource funding as a producer/director, so I was very excited yet scared. One thing I learned is that you have to put so much work into pushing your crowdsource funding via social media and word of mouth. I managed to raise $6.256 from the pledged goal of $5K. This was enough for me to pay the editor and audio and use it for marketing and PR and additional VFX support work I needed to make the final cut of the film. I didn’t need much funding since I was doing all the shot creations and animation myself but there were some elements, like the motion graphics of on screen displays, that needed doing and rendering out as elements for me to put into Nuke, so I had some help with that, as well as the extensive amount of rotoscoping required for the DSLR photography I shot with my partner May Ngo for the miniatures – posed marine models, tanks, helicopters etc and, of course, the cats and dogs. I was able to gain so much interest from the fans and new audiences of the film to allow me to make the extended redux edition. The power of social media is amazing and is definitely the future for indie film making and distribution! Following the same VFX support model I used for the first version, this extended edition has visual effects technology support from Peregrine Labs (the developers of the powerful depth of field plugin – Bokeh), Gen- Arts (the award winning Sapphire plugins used for years on big movies) and Shotgun (the asset management tool system used in most of the major facilities worldwide). In fact having VFX technology support not only allowed me to have access to these tools but also free exposure with their marketing team. For example for 2011 Siggraph ‘Fubar’ was used as a demo to show off Shotgun’s new asset management tool and The Foundry had shots from my film in its Sizzle Reel! Haz’s film credits include: Fubar – 2011, Prince of Persia, Sands of Time – 2010, The Conductor – 2010, Don’t Look Back – 2009, The Dark Knight – 2008, Hellboy II The Golden Army – 2008, Chronicles of Narnia, Prince Caspian – 2008, 10,000 BC – 2008, Tales of the Riverbank – 2008, Elizabeth, The Golden Age – 2007, Spring Heeled Jack – 2006, Chicken Tikka Masala – 2005. Television: Nova – 2011, Planet Dinosaur – 2011, America, The Story of Us – 2010, Inside the Perfect Predator – 2010, The Colour of Magic – 2008, Superstorm – 2007. Games: Enemy Territory – 2007, Battalion Wars – 2005. The plasterer needs the technical skills and the creative ability to be able to construct realistic props and materials which blend in with the surrounding period details and must be able to understand and interpret technical drawings. From an article published in Network Nine News – if you would like to receive the magazine please contact info@network-nine.com – it’s only £12 for a years’ subscription! My journey as an apprentice ornamental plasterer in the film industry has been an enjoyable and rewarding one. So far I have learned a variety of different skills which I know that I can fine tune over my career. I attended Acton College beginning with the basics of solid plastering and then, during my second year I was introduced to a different form of plastering – fibrous – which opened a whole new aspect of the world of plaster! I immediately felt that I’d found something which stretched my technical and creative capabilities and which I could envisage myself doing for life. I was introduced to this field by Charles Green, a plasterer in the film industry and my mentor. He came to the college and chose six boys to participate in a short movie set building course. This short course taught me so much more and then Charles chose three boys, including me, to have a go at working on a film set so I went on to work for Ken Barley, Head of Department Ornamental Plasterer on ‘Prince of Persia – The Sands of Time’ which was an amazing experience! This film acted as a stepping stone and the start of my career in the film industry. Since then I have worked on ‘Robin Hood’ and ‘John Carter of Mars’ for Doug Allen, who has also been very influential – and I am currently working again for Ken Barley on ‘Hugo’ – so he must have thought that I did a good job on ‘Prince of Persia’! On this film I will finish my apprenticeship and within a year I will have completed my improvers training. Working hard on the initial training process is essential. The plasterer needs the technical skills and the creative ability to be able to construct realistic props and materials which blend in with the surrounding period details and must be able to understand and interpret technical drawings. Above all, we need to work with the team, be punctual, pleasant and willing to do what is needed to finish the job on time and within budget. I’m now looking forward to a long and fulfilling career in the film industry. After more than 40 years in the Film Industry and 30 years as a Supervising Sound Editor, I have learnt this – if you want to make the Film Industry your career, talk to as many professionals as you can, always display keenness, never be late, never complain about having to work ridiculous hours, learn the basics before you even try to get a job, be humble (you may think that you can do the job better but don’t forget they already HAVE the job) and, above all, learn to make a good cup of tea! Best job in the world! Eventually my Dad, film producer Teddy Joseph, said in exasperation, ‘What DO you want to do?’ Now, I have to say that I had also failed as a singer/songwriter, although I had appeared with Tom and Jerry (later to become Simon and Garfunkel) in a Folk club in Chesham, so my artistic ambitions were severely dimmed. ‘Wouldn’t mind getting into the film industry Dad, like you’. Another friend I had made at Shepperton told me that Illustra Films, a successful commercials company in Soho, were looking for a trainee assistant editor and, by training in the cutting rooms, I would eventually get my ‘ticket’. Illustra didn’t need a trainee but they did need a bookkeeper! I agreed to sort out their books provided that, when an opening arose in the editing department, I would move across. After a couple of months this happened. I was trained up to assist, to cut Sunday Times commercials, to run around Soho and generally have a great time. A year later I got my ticket, forgot about working on the production side and got a call from John Taylor, a music editor on a TV series at Pinewood Studios called ‘Strange Report’, telling me that they needed a 2nd assistant picture editor. On that series I worked with a wonderful man, Keith Palmer, who later took me as his assistant on both picture and sound projects. In 1974 I assisted Leslie Hodgson on ‘The Odessa File’ and subsequently, an ITC/RAI TV series ‘Moses the Lawgiver’ starring Burt Lancaster. When all the editors had left, Roger Cherrill (the owner of the Post House) asked me to be the sound editor on the re-cut feature version. The main editor was Gerry Hambling. I assisted him for a few years on films such as ‘Midnight Express’ and ‘Fame’. Then in 1981 Alan Parker asked me to be the sound editor on ‘Shoot the Moon’. That was my first film as Supervising Sound Editor and sound editing has been my life for 30 years. I progressed through a form of apprenticeship. I don’t think that there were any film courses when I started. Unfortunately, the editorial structure has changed since 35mm magnetic and not many sound editors now have the luxury of an assistant – but I learned from watching over the editor’s shoulder and absorbing the knowledge by a form of osmosis. There are many courses now at film schools and universities that flirt with sound editing and design and some, like the National Film & Television School, which specialise. The problem is always how to leap from the confines of education to the élitism of the cutting room. Luck, application, hard work and more luck are needed – and it is still ‘who you know’ more than ‘what you know’. To answer the question. There are no specific qualifications required to start sound editing. It would be useful to have a technical background and a working knowledge of ProTools or a similar sound editing tool. A degree, HND or BTEC in some area of sound could be an advantage but is not necessary. Indeed one of the foremost sound designers in the UK left school at 16 and started straightaway in the cutting rooms. HOW DO YOU HAVE TO INTERACT WITH OTHER DEPARTMENTS? We couldn’t operate without a close relationship with the editorial department. In fact, it was always the picture editor who chose the sound editor. That isn’t so much the case these days as sound editors can be appointed by the director, producer – or be a part of a post-house package . The sound editor’s loyalty, however, must always be to the director and the picture editor. We should be able to take the editor’s working track, which may include sound effects that we have already supplied and start from there. The picture assistant should be encouraged to liaise with the sound department whenever changes are made to the picture. I was interviewed in the mid 90’s by a director who was looking for a sound editor for his high profile project. ‘I shall expect alternatives for the sound effects’ he said. ‘Oh’ I said ‘you’d better look for someone else. I don’t lay up alternatives’. ‘Why ever not?’ he questioned. ‘Well, when I track-lay the effects that I feel are right for the particular scene, I move onto the next scene. Surely you should employ someone who is confident in their creative ability?’ I got the job, didn’t lay alternatives and was never asked for one! During the crossover period between magnetic and digital sound, we realised that the new technology was really not tried and tested. We were the guinea pigs. One of the problems was how to keep the projector, the 35mm recording master and the digital play-off tracks in sync. On one film the re-recording mixer and I were so concerned about sync slippage that we transferred out all the dialogue premixes onto 35mm and I spent all night re-cutting those premixes so that they were perfectly in sync with the picture. ‘Angel Heart’, directed by Alan Parker in 1986, was a wonderful film to work on. Apart from it being a fascinating film for sound design, most of the post-production was done in Paris! Although we started the premixes in Elstree, we finalled in Los Angeles at Warner Hollywood Studios. It was my first experience of mixing in Hollywood! One of the reasons I moved over to sound editing was having the privilege of working with Alan Bell. In 1969 I was the 2nd assistant picture editor on ‘I Start Counting’, a thriller directed by David Greene. The editor, Keith Palmer, brought on Alan Bell two weeks before the end of principal photography to do the sound. This practice has long gone. It is now considered perfectly acceptable to start the sound department after the film has been locked, rarely leaving enough time to think the project through. Alan was a stocky, heavily bearded ex-Merchant Navy man with a penchant for roll-ups and drink. Many drank then – in fact it was normal to have a couple of pints every lunch-time. It didn’t seem to affect efficiency and creative perception! An early scene in the film featured a teenage girl (Jenny Agutter) going into the woods to play in a deserted cottage. In the corridor near Alan’s room I could hear strange bird coos and wing flaps. What Alan was doing was laying pigeon sounds as if they were emanating from the roof of the porch so that whenever Jenny (or anyone else for that matter) went in or out of the cottage the birds would be disturbed. I realised then how important ‘sound’ was to story telling and that one sound could create or destroy a mood. I started working on 16mm and 35mm (both picture and sound), editing in mono on Synchronisers and Moviolas. Sound accuracy (on 35mm) was to one sprocket or 1/96 second. When the mix was complete an Optical 35mm Negative would be shot, processed overnight and, after the print had dried, played back the next day. The last mono film I worked on was ‘Another Country’ in 1983, although I had track-laid and mixed for 6 track Magnetic and Dolby Stereo on ‘Pink Floyd the Wall’ in 1982. The Dolby 2tk Stereo was a fantastic advance which I enjoyed using on ‘Birdy’in 1984. The first ‘digital’ film for me was ‘Damage’ in 1992. 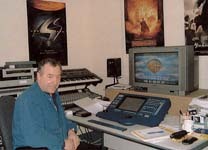 Louis Malle’s sound recordist, Jean-Claude Laureux, decided to record the production dialogues digitally on a DAT machine. 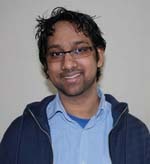 Louis requested that the dialogues should be edited digitally. I was offered the sound editor’s job by John Bloom provided that I learned to use a Digital Work Station. I only track-laid one more 35mm magnetic film after that. My first DWS was a DAR 8 track and I stayed with DAR until ‘Cold Mountain’ in 2003 when Walter Murch suggested I should use a ProTools system. 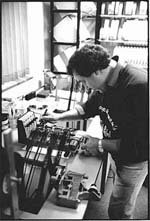 When I started, I was taught how to scrape the magnetic oxide off the track to reduce clicks, sibilance and to create fades. How different it is now! There were also a maximum of 3 sound editors on a film. 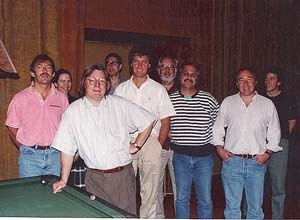 The sound effects editor supervised with a dialogue editor and a foley (footsteps) editor – each editor had an assistant. Now there can be as many as 10 editors but only 2 or 3 assistants on the big films and there is much more specialisation. There are sound editors known for certain facets of sound for example, vehicles, guns, animals and atmospheres. There are usually 2 dialogue editors, one for production dialogue and the other for ADR. You may get a foley supervisor and several foley editors and, of course, specialist sound designers.